At Porsche Riverside, we’re dedicated to customer satisfaction. We strive to make every dealership experience, whether you’re purchasing a car or servicing your current vehicle, one that exceeds your expectations. We take pride in the reputation we’ve built, and we’re proud to share that we’ve been the winner of numerous awards for customer satisfaction. For the past five years in-a-row, Porsche Riverside has been named the #1 Rated Porsche Dealer in the United States and the #1 Rated Porsche Dealer in California by DealerRater. 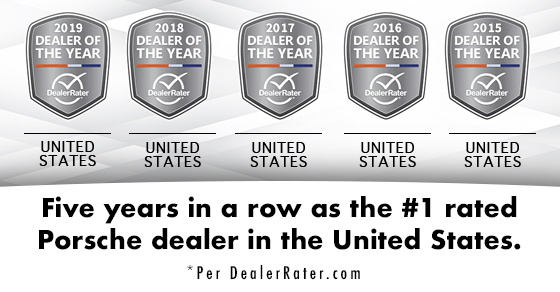 DealerRater is one of the top car dealership review websites for consumers and annually announces Dealer of the Year award winners. The Dealer of the Year award recognizes dealerships for their outstanding customer service, based on reviews shared on the dealership’s DealerRater page. Award winners are determined by the dealership’s DealerRater star rating and total number of reviews written in a calendar year. DealerRater’s scoring is based on categories, like quality of work, friendliness, pricing, customer service, and overall experience. 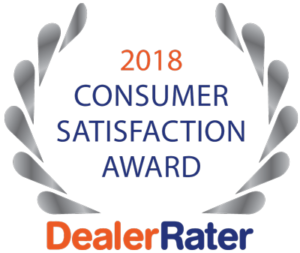 Consumer Satisfaction Award recipients mush meet the same criteria as the Dealer of the Year award program and are given to the top 10% of U.S. franchise dealers based on their PowerScore. In order to be recognized as a Top Rated Dealer by CarGurus, a dealership must meet the customer review requirements which include hitting a specified customer review count all while maintaining an overall star rating of 4.5 or higher. CarGurus uses a standard rating scale of 1-5. The Five-Star Dealer award is used to recognize dealerships that consistently deliver great car-shopping experiences to their customers. Edmunds presents this award to dealerships that have earned the highest overall rating for customer satisfaction in Edmunds’ dealer sales ratings. In order to be eligible for this award, dealerships have to participate in the Edmunds Dealer Partner program and must have earned an overall sales rating of five stars on a minimum of 20 reviews on Edmunds over a calendar year. In addition, the dealerships must have maintained at least a 4.5-star average over the past two years to be recognized. Porsche Riverside has been awarded this now for over 3 years in a row!